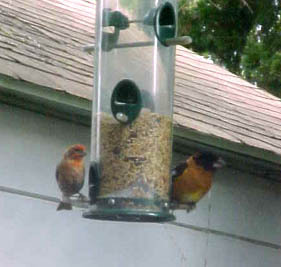 The house finch of the left of both pictures is the average bird that comes to the feeder. Occasionally, a house sparrow will show up. And frequently, black phoebe or warbler will show up to watch the spectacle of infighting for perch space, but they will go about their insect eating ways. My housemate Lauren told me that she recently saw a bright yellow bird at the feeder (goldfinch? 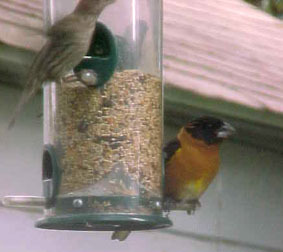 ), but today is my very first time of seeing a Grosbeak at the feeder. After consulting my bird guides, I determined that this fellow is a Black Headed Grosbeak. Thank you, sir, for showing up and making my morning much brighter. by Ms. Jen on Thu May 15, 2003 | Permalink | nature + environment.